With Rosh Hashanah just around the corner, it seemed only fitting to post something rammed with honey and doused in apples. Jewish New Year is one of my favourite holidays -- round challah, autumn apples dunked in honey, pomegranates (new fruit you haven't eaten all year) and so many more family classics. I'll be heading home to spend the holiday with my family, and I know that there will be tons of food awaiting my arrival, as well as several long over due hugs and cuddles with my sisters and parents. I can't wait -- count down to Wednesday night is on. 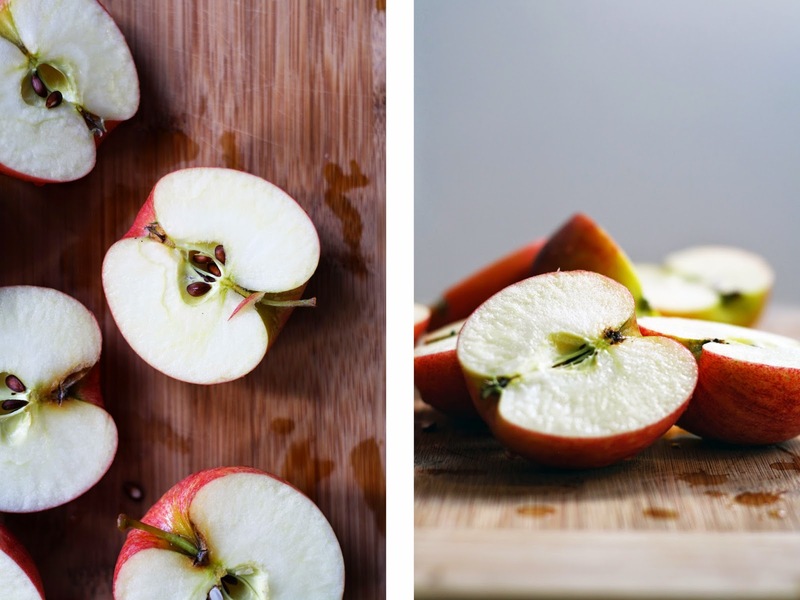 If you're looking for some additional apple recipes to adorn your table for the holidays, try a breakfast pancake, baked apples, crisp, soup or lunch time grain salad. Chag Sameach & Shana Tova! 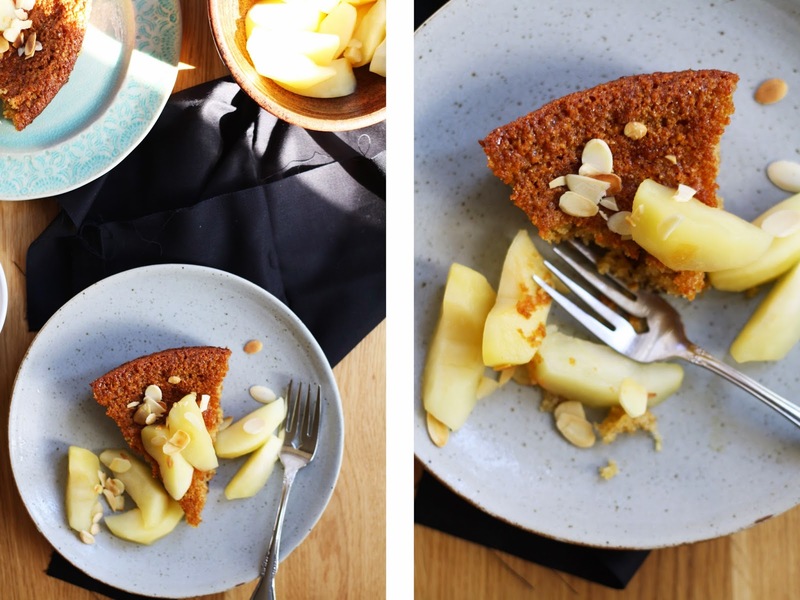 This cake is gluten free, perfectly drenched in honey, and works equally well for breakfast or dessert, warm or cold. Loosely inspired by Vibrant Food. In a large bowl, combine the dry ingredients and stir until combined. In a separate bowl, whisk the eggs, honey, oil and grated ginger. Pour the wet ingredients into the dry and mix just until combined. Transfer the batter into a greased and lightly floured baking pan. Bake for 25-35 minutes until the top is golden brown, the centre is set and a toothpick comes out clean. Let cool on a wire rack. To poach the apples, combine the water, lemon juice, brown sugar and marmalade in a saucepan. Bring to a boil, then lower to simmer and gently transfer the apple wedges into the pan. Partially covered, simmer for 15 minutes or until tender. Remove the fruit from the liquid and set aside. Boil the syrup rapidly for 5 additional minutes. 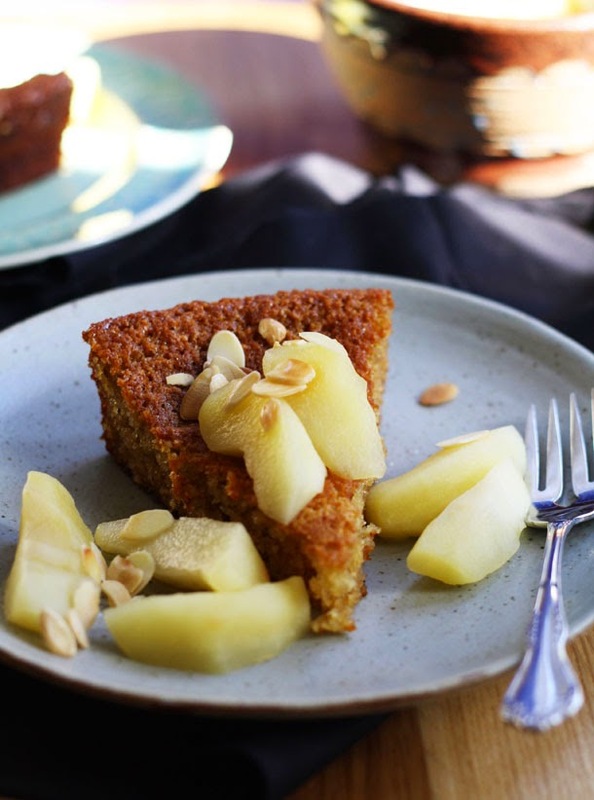 To serve, transfer a cake slice onto a plate, sprinkle with toasted almonds, a few apples slices and an optional spoonful of syrup.